Rabbit hutch building plans. Get our plans for building rabbit cages, rabbit hutches, large rabbit run, and modified colony pasturing plans. Plus ideas for large rabbit barns. At Aurora Rex Rabbit Ranch, we built our own rabbit housing. And then we compiled our various hutch building plans so you can make the same long-lasting cages, hutches, burrows, and large wheeled rabbit runs that we built and use. Are you handy with tools? 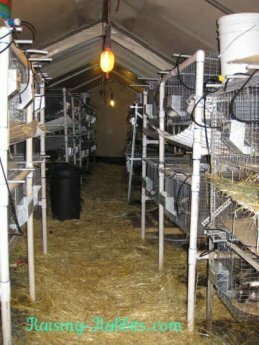 Want to save a LOT of $$$ on rabbit housing? 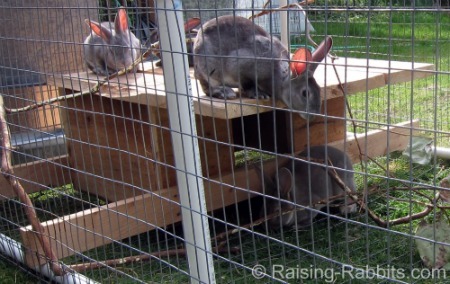 Then you'll love DIY Livestock Rabbit Housing for Meat & Show Rabbits. Every rabbit needs some sort of a secure cage or enclosure. You can free-range chickens, but not rabbits. Rabbits? They’ll dig out of your enclosure, and make their own burrows and colonies. And why not? The environment around them is their dinner table, and it’s greener on the other side of the fence. If they like you, they may not go too far--if they survive--but don’t count on it. Do YOUR rabbits fall into the category of livestock? And of course, large commercial production herds. These are all rabbits raised for a specific purpose, most often meat, with fur being a by-product of rabbit consumption. Livestock rabbits are rabbits raised in humane settings in order to serve mutually beneficial purposes. Livestock rabbits are never ‘factory-farmed’ or ‘rabbit-milled.’ In the world of raising rabbits, every buck and every doe requires its own cage and personal care, whether the herd comprises a few, a few dozen, or a few hundred or more rabbits. In return, they reward you with health, contentment, and many offspring. Any rabbit owner or breeder who needs cages for more than 2-4 rabbits will be very happy for these rabbit hutch building plans. 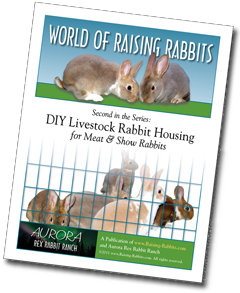 DIY Livestock Rabbit Housing provides ideas, plans and extensively illustrated directions for housing methods well-suited to livestock rabbits. These are the methods used at Aurora Rex Rabbit Ranch. Plus we offer reviews of other rabbit housing options. Take our rabbit hutch building plans and build them exactly, or tweak them to suit your needs. We give you varying cage dimensions to suit the needs of nearly every rabbit breed. 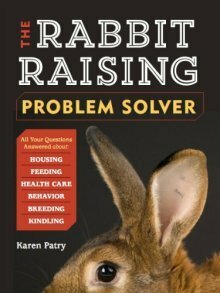 Building just one of the projects in this e-book will save you double or triple the cost of DIY Livestock Rabbit Housing. We’ve included, and greatly expanded upon, the valuable rabbit housing information on Raising-Rabbits. Plus, we’ve more than doubled the number of illustrations and photos. 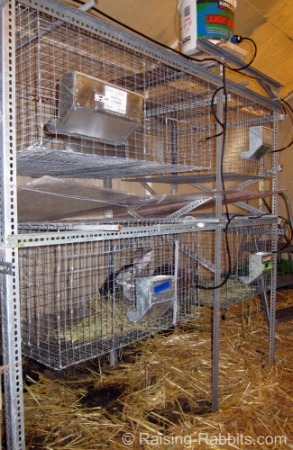 The all-wire cage, PVC rabbit hutch and rabbit run offered on Raising-Rabbits. We enhanced the plans in DIY Livestock Rabbit Housing and thoroughly illustrated them. "Your DIY Livestock Rabbit Housing book is fantastic. I am interested in the angle iron hutch, personally. I think the book will give a hand to a lot of new rabbit breeders"
If you like what you've seen at Raising-Rabbits, you’ll be very pleased with the enhanced and illustrated directions found in DIY Livestock Rabbit Housing. 89 pages and 15 chapters of rabbit-pleasing housing plans, all for the ultra-low price of $8.49. In fact, the very first completed project will already save you a minimum of double or triple the price of the book. The e-book’s file size is very large because of the many pictures, diagrams and information showing you exactly what to do. Do be patient as the PDF e-book file downloads onto your computer. Build your rabbit housing right the first time.